Woozworld mixes a virtual world with social networking and has been online since 2009. The games audience is teenagers and tweens but has also attracted some older players due to the social networking experience on offer. Starting out in Woozworld is one of the fastest experiences you’ll ever have and you can be setup with your account and customising your avatar (known as a Woozen) within seconds. The Woozworld experience is very similar to other games in the genre but what separates it from these games is the level polish. In Woozworld you will create your own avatar from the huge selection of options available, develop your own house, explore a near endless game world, hang out with friends, host parties, play a large number of games or compete against others in the regular contests. 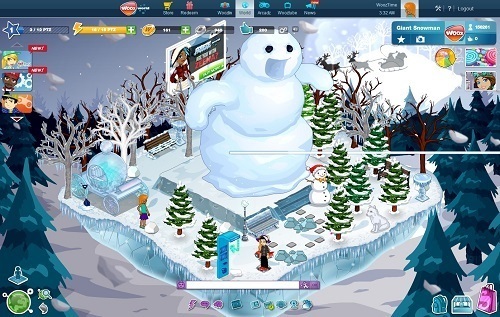 Being a late comer to the virtual world genre in 2009 allowed Woozworld to take the best parts of the popular virtual world games like Club Penguin and add their own spin on them while perfecting them further. The result is a highly polished, interactive, fun and ultimately safe experience that can be enjoyed by all ages within their browser. Just like every other game in the genre free players have the option to upgrade their accounts with a subscription which includes increased currency earning potential, access to extra areas, a weekly allowance and more. Compared to other subscription upgrades for similar games you are definitely getting a good amount of content for your dollar. WoozWorld has plenty of freedom that is definitely worth checking out if you are a fan of virtual world experiences. Be aware though that the game audience is slightly skewed towards a younger female audience with its gameplay and fashion options. Plenty of activities to enjoy. Large user base so there is always someone new to chat with. Gameplay is focused towards a female audience. I used to play this game a lot. I like the book islands, I used to read a lot of novels and those islands have some good book recs on them. On the other hand, I stopped playing because a lot of the good stuff were too expensive to buy, especially those that need a lot of gold coins.